Three recent San Diego State University graduates will take part in the 2017-18 U.S. Fulbright program, one to study obesity in India and two as English teaching assistants overseas, the school announced Tuesday. 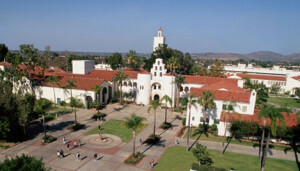 San Diego State University. File photo. “Having the opportunity to explore the world during their college years is a transformational experience for our students,” said Eric Rivera, SDSU vice president for Student Affairs. Sudha Royappa, a 2016 SDSU graduate, plans to work with healthcare professionals in the state of Tamilnadu, where rates of obesity and excess weight in men have increased by 95 percent over the last 10 years. “Historically, India has suffered from high rates of malnutrition, but accelerated economic growth combined with urbanization, technological advances and the nutrition transition have led to unprecedented rates of overweight, obesity and their associated cardio-metabolic diseases,” said Royappa, who has a master’s degree in public health. “The healthcare community is in an ideal position to modify the public’s health beliefs, rally schools and businesses to change the nutritional environment and lobby community leaders and government for policy changes to ensure the optimal health of their people,” she said. Sahil Mehta, also a 2016 graduate, will teach English in Brazil and hopes to work with professors there to increase the instruction of diverse languages at home in the U.S., according to SDSU. He also wants to use his dancing talent to explore Brazilian music. Kellie Quinn, who recently received a master’s degree in public administration, will teach English in Morocco and introduce students to the diversity of U.S. culture. The Fulbright U.S. Student Program, initiated in 1946 and funded through congressional appropriations, offers research, study and teaching opportunities in more than 140 countries to recent graduates and graduate students. SDSU has produced 88 Fulbright scholars since 2005-06.